Colleges and universities in South Carolina are at the forefront of career preparedness initiatives, providing cutting-edge partnerships with major corporations and tech companies that create direct employment pipelines for students after graduation. This is encouraging for aspiring college students interested in earning a college education in order to enhance career and salary potential. And with growing online learning opportunities in the state, these programs are more accessible to students nationwide than ever before. 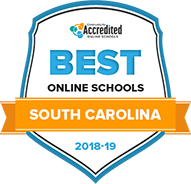 If you’re interested in earning an online degree, read on to learn more about the programs South Carolina has to offer, and get answers on common questions about tuition, transfer credits and college preparedness along the way. Aside from large universities that first come to mind, South Carolina also has a number of specialized schools, including ones that cater to the medical and technical fields, which offer online degree options. As you start to research, it can be helpful to know which colleges are going above and beyond for their online students—our rankings use both qualitative and quantitative analysis to determine which schools provide the best mix of online student support and quality online learning to point South Carolina students in the right direction. Clemson University provides entirely-online graduate Clemson University provides entirely online graduate degree programs or blended programs that require students to participate in online meetings, hybrid classes, and/or independent study topics. Students can earn an online master's degree in public administration; teaching and learning; athletic leadership; biology, with a specialization in wildlife and fisheries biology; human resource development; industrial engineering; construction science management; parks, recreation, and tourism management; and youth development leadership. Clemson also offers 3 doctoral programs in health care genetics; parks, recreation and tourism management; and rhetorics, communication and information design, as well as a program for registered nurses to earn a bachelor's degree in nursing. Most degree programs are designed to be completed in 3 years or less. Students who have 2 years of previous college credit can complete their degree online at University of South Carolina-Columbia. This college offers degree completion programs in elementary education, several areas of healthcare including health promotion and health informatics, information management and systems, criminal justice, organizational leadership, hospitality management, human services, special education and business administration with focuses in management or accounting. Current registered nurses can earn their bachelor's degree in nursing through an online, 12-month RN to BSN program. Graduate students can enroll in hybrid or online master's degree programs to earn a degree in statistics, education, a range of engineering specialties, library and information science, nursing or public health. These master's degrees are designed for completion by full-time students in 2-3 years. Adult learners can enter online undergraduate degree programs at North Greenville University to earn their bachelor's degree. The college offers online bachelor's programs in business and leadership, Christian ministries, criminal justice, applied psychology, elementary education studies and general studies. Courses run for 8 weeks and incorporate Biblical principles into the curriculum. These degree programs are designed to be completed in 4 years. There is a scholarship available for online undergraduate students residing in South Carolina, and NGU provides need-based financial aid to online students. The Citadel Military College of South Carolina offers military-focused online degrees to students in 38 states and worldwide. The Citadel has 3 online bachelor's degree completion programs in business administration, criminal justice and intelligence and security studies. Students can transfer at least 24 credits toward their degree through these programs. The Citadel also provides 6 fully-online master's degree programs in business administration, leadership, intelligence and security studies, interdisciplinary STEM education, international politics and military affairs, and social science. These graduate degrees can be completed in 2 years or less by full-time online students. Distance learning students pay the same rate per credit hour as in-state students attending The Citadel's online degree programs. Columbia International University offers a range of online master's degrees in religion, with concentrations in Bible exposition, chaplaincy, intercultural studies, divinity, ministry studies, Muslim studies, care and counseling, theological studies, and youth ministry leadership. Online students can also earn a bachelor's degree in business, or a master's in business administration or education. CIU provides one online doctoral degree program in educational leadership. Tuition rates vary depending on the course of study a student pursues, not on where they live while attending online degree programs. The college accepts international students into online programs, but some master's programs require interested applicants to provide a reference from a church leader. Lander University provides 3 online graduate degree programs and 1 undergraduate degree program for registered nurses to earn their bachelor's degree in nursing. Earning a master's in nursing through Lander's online program qualifies students to sit for the Clinical Nurse Leader certification exam. Online students will earn their clinical hours through placement in their geographic area. Lander's online master's in education program offers 2 specializations in instructional technology and diverse learners. Graduate students can also earn an online master's in emergency management at this college. Some online programs accept transfer credit. Students earning an online degree through Anderson University can explore bachelor's degree programs in business, Christian studies, criminal justice, health care or liberal studies. Graduate students can earn an online master's in business administration, which offers concentrations in health care leadership, human resources, marketing and supply chain management. Anderson also has programs for both a master's and a doctoral degree in ministry. Graduate degrees can be completed in 2 years of full-time study, and online classes run for either 6 or 8 weeks. Coastal Carolina University offers online undergraduate degree programs in hospitality, resort and tourism management, and marketing. Students can also complete a bachelor's degree in health administration. Graduate degrees include a master's in business administration, information systems technology, instructional technology, literacy or special education. Many of these graduate programs can be completed in one year. CCU also provides an online doctoral degree in instructional technology for teachers who have already completed a master's degree in this field. Transfer credits are accepted in most degree programs, and most classes are primarily self-directed, though some instructors may require online attendance for specific events. Online courses at Southern Wesleyan University last 7 weeks and can be taken year-round. This Christian college offers 4 bachelor's degrees in nursing; human services; early childhood and family studies; and business administration with concentrations in accounting, general business, finance, human resource management, marketing, supply chain management and general management. Graduate students can earn an online degree in areas of education and business, and SWU provides one doctoral degree program in curriculum and assessment. Online students pay a set fee for classes whether they live in-state or out-of-state. Students at Claflin University have access to four bachelor's programs and three master's programs that can be completed entirely online. Current registered nurses can earn a bachelor's in nursing, or students can pursue undergraduate degrees in psychology, organization management or criminal justice. There is also a master's degree in criminal justice available at Claflin, as well as graduate degrees in business administration or curriculum and instruction. Undergraduate degrees can be completed in under 4 years of full-time study, and some master's degree programs take as little as 18 months to complete. International students are eligible to enroll in some online programs, as well. The college provides resources on financial aid that for students attending Claflin online including those from out of state. How can I find which online colleges offer the degree I'm looking for in South Carolina? Not every college or university in South Carolina offers online courses, but many of the best do. The easiest way to learn about online program offerings is to go online: colleges that offer online degrees will list the most current information on their websites. The University of South Carolina, for instance, partners with Palmetto College to offer its classes online. Online students at the University of South Carolina enjoy similar coursework to what they would find on campus. Most online programs at USC require applicants to have at least two years of previous college credit, so students aiming to complete a USC degree online must first log some time on campus. USC's online program is best for those going into education, criminal justice, nursing, information science, or business. Many religious institutions in South Carolina offer online degree options, as well. One such school is Charleston Southern University, which offers online degrees in healthcare administration, hospitality and tourism, human resources, project management and computer and information sciences. This school is affiliated with the Southern Baptist Convention and integrates faith into its coursework. Which online schools in South Carolina will accept my transfer credits or work/life experience? Many online schools in South Carolina offer credit for prior college courses. For example, Limestone College, a private Christian college, allows its students to transfer up to 66 credit hours from accredited two-year colleges and up to 92 hours from accredited four-year colleges. Columbia College, which is geared toward women, accepts up to 90 credit hours from an accredited university. Newberry College attracts adult learners with its life experience credit allowance. Students can earn up to 15 semester hours of academic credit for experience such as field research, study, travel, professional or military training, internships, and other alternative educational experiences. Students can get approval for these credits by test, certificate of documented competency, or an approved portfolio. There is a portfolio approval fee of $77 for the first credit, $60 for each additional credit, or a three-credit cost of $197. The life experience must relate specifically to courses found in the Newberry College catalog. Newberry College has a Lutheran foundation but offers degrees in a variety of areas. How Much More Do College Grads in South Carolina Make? In South Carolina there is, on average, near a $30,000 difference in pay between jobs that require a bachelor’s degree and those that require a high school diploma. Data from the U.S. Bureau of Labor Statistics shows that jobs requiring a higher minimum education pay more on average, at every level of education. Looking at the economic marketplace in South Carolina, the unemployment rate is low, but available jobs are also in short supply. This could be beneficial for those who want to pursue a higher education—earning a college degree may help your resume stand out from your peers. Medical and healthcare degrees are winners in South Carolina—of the jobs listed as the fastest-growing occupations in the state, half are in the medical field. These positions include home health aides, nurse practitioners, physical therapy assistants, physician assistants and physical therapists. Technology degrees are also projected to be in demand across the state, especially in web development and information systems. The accreditation process works to make sure schools hold their academic systems to the highest standard. Students should seek out online universities in South Carolina that hold accreditation to be sure they receive a top-notch education that employers respect. Accreditation also better enables you to transfer credits will transfer to other schools if you were to consider extending your studies. The Southern Association of Colleges and Schools Commission on Colleges (SACSCOC) is South Carolina’s regional accrediting body. Their website provides a listing of member schools, which are located in a 11 states including Florida, Virginia, Tennessee and North Carolina. In addition to national or regional accreditation, some schools elect to receive program-specific accreditation. The Citadel, a well-known military school, is accredited by the SACSCOC regionally, while the National Council for Accreditation of Teacher Education backs the school's educational graduate degree programs, and the Association for the Advancement of Collegiate Schools of Business accredits The Citadel's School of Business. South Carolina students have several federal aid opportunities available to them. Online learning itself can provide a more cost-effective degree path, especially for adult students who need to take classes while working. For example, Anderson University charges $460 per credit hour for undergraduates. Students taking 15 hours at Anderson would pay $6,900 per semester through this program, significantly cheaper than the average freshman tuition on-campus of $12,570 per semester. Read on to get more answers on frequently asked questions regarding cost for online schools in South Carolina. What are South Carolina's requirements to qualify for in-state university tuition? The South Carolina Code of Laws sets residency requirements for all higher learning institutions in the state. Students can establish residency in the state if they have lived there for at least 12 continuous months before starting their first term at school. They can also claim in-state tuition if their parent, guardian, or other provider pays more than half of of their education expenses, claims the student as a dependent, and has South Carolina residency. Students who live in South Carolina for the primary purpose of attending school there do not qualify for residency, even if they meet the 12-month requirement. Are online credits more affordable in South Carolina than other places? How can I get help paying for online college in South Carolina? Financial assistance in the form of scholarships and grants can help students and their families. Many South Carolina scholarships are geared specifically toward on-campus learners, so students often must attend their institutions in-person to qualify for scholarship aid. Limestone College, which has both on-campus and online options, works with students after receiving FAFSA applications to find them the assistance they need. Anderson University points out that its evening classes are already discounted, so no university-specific assistance is available to students in those classes. North Greenville University offers a scholarship program specifically for online students. The Martin Timothy Brashier Scholars program is specifically for South Carolina residents or previous graduates who are pursuing an online degree at North Greenville. These awards equal one credit hour per course for the first 12 hours of enrollment. As part of a national study on adult learning, the U.S. Department of Education conducted a study of students during the 2016-17 school year. South Carolina had far more students participating in adult learning programs than many other states in the study: more than 25,000 students took advantage of the services.